…just bake them in the oven. And the real secret to getting them to cook perfectly is to first steam them in a steamer basket over boiling water for 10 minutes. Carefully pat them dry and place them on a oven proof rack (or parchment paper) in a sheet pan, sprinkle with about 1/2 teaspoon of kosher salt and place in the refrigerator for about an hour. Then stick the whole deal in a 425 degree oven and bake for about 40 minutes until golden and crispy, turning the wings over halfway through. This cooking technique is from Alton Brown, but in his recipe, he wants you to add butter and garlic to the sauce, which is absolutely unnecessary (and not authentic!). When the wings are done, just toss them in a generous helping (about 1/2 cup) of warmed Frank’s Red Hot Sauce until completely coated and serve with bleu cheese dressing and celery sticks. There you have it…all the crispness, texture and flavor of deep frying with none of the mess. so easy to make and soooo yummy! Mix all the ingredients in a samll sauce pan over low heat until the margerine is completely melted, then stir until everything is blended into the sauce. Then get the sauce off of the heat !! This last step is quite important, as any additional heating tends to kill the flavor. The Wings – use about 30 completely defrosted wings. Fry in peanut oil for the best flavor. Heat the peanut oil to 375 degrees F., and drop in half of the wings, one at a time. Fry the wings for 12 to 15 minutes. 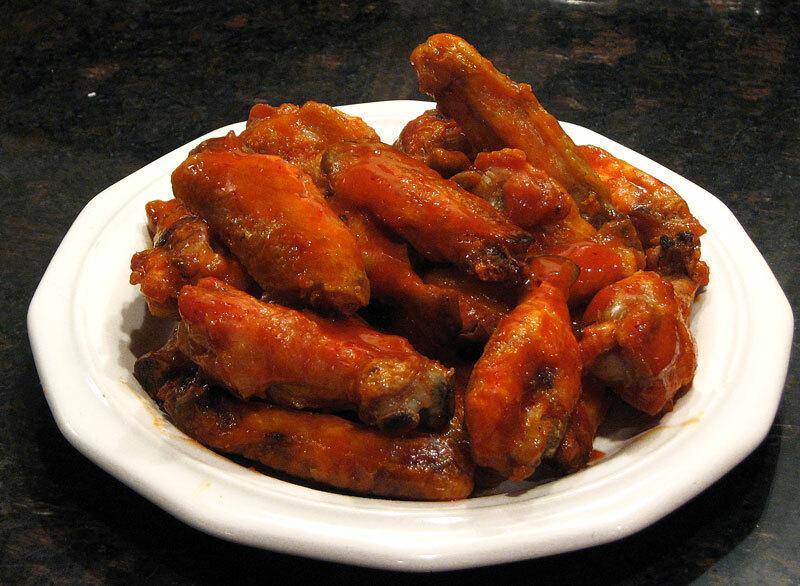 Place the other 15 wings in the deep fryer, then drain the hot, cooked wings for a few minutes through a strainer, preferably placed over the deep fryer. When all the wings are cooked, put the wings and the sauce in a container with a cover and shake the container until the wings are thoroughly coated.